Gold traded lower overnight in a range of $1312.45 - $1325, breaching support at the $1315 double bottom of the last 2 sessions. Gold was pressured by strength in the dollar (DX from 91.48 – 91.90), which was boosted by a weaker euro ($1.2139 - $1.2072, lower than expected reading on German Retail Sales), and pound ($1.3791 - $1.3713, UK Home Secretary Rudd steps down in immigration scandal). Firmer global equities were also a headwind for gold with European markets up from 0.1% - 0.5% and S&P futures up 0.3%, with Japan and China closed for holidays. A decline in oil (WTI from $68.20 - $67.22, Baker-Hughes Rig Count was up 5) limited the rise in equities. Other calming geopolitical factors weighed on gold as there was a continued thawing in North-South Korea relations (South said it will remove loudspeakers that blared propaganda across to the North, North said it would align its clocks to the South), and a growing optimism over the upcoming US-China trade talks this Thursday and Friday. At 8:30 AM, reports on Personal Spending (0.4% vs. exp. 0.4%), PCE (0 vs. exp. 0) were as expected, but Personal Spending was a slight miss (0.3% vs. exp. 0.4%). S&P futures slipped (2675), and the US 10-year bond yield fell from 2.97% to 2.949%. The dollar pulled back (DX to 91.78), and gold bounced to $1315. However, the weakness in the DX proved short lived, as currency traders bought the dip in the DX and took it up to 91.91. Gold fell in response, but found support ahead of the quadruple bottom support at $1307-10 (lows from 3/16, 3/19, 3/20, and 3/21). Subsequent reports on the Chicago PMI (57.6 vs. exp. 58) and Pending Home Sales (0.4% vs. exp. 0.8%) disappointed, and US stocks turned down (S&P +1 to 2672) after a stronger opening. The DX retreated back to 91.78, and gold popped higher from some bargain hunting bids to reach $1316. Into the afternoon, US stocks slipped further (S&P -13 to 2656, telecom lags), hurt by comments from Israel’s Netanyahu (Iran lied, had secret project to design, produce and test warheads - hopes to sway Trump to restore sanctions on Iran). Oil spiked to $69.31, the 10-year yield slipped to 2.936%, and the DX pulled back further to 91.67. 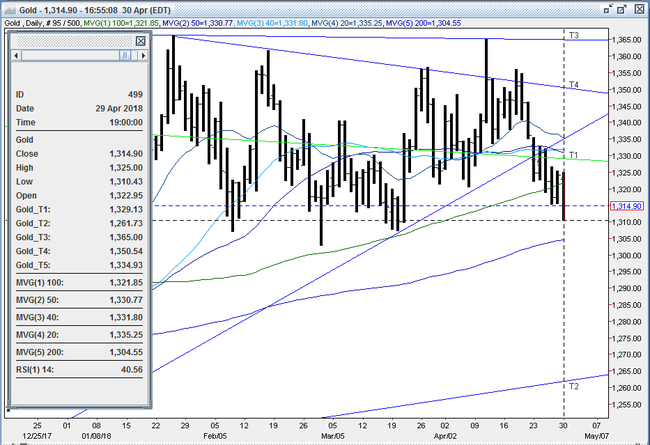 Gold ran higher, and recovered to $1320, with some short covering seen. Later in the afternoon, US stocks fell further (S&P -21 to 2648), while the US 10-year yield ticked up to 2.951%. 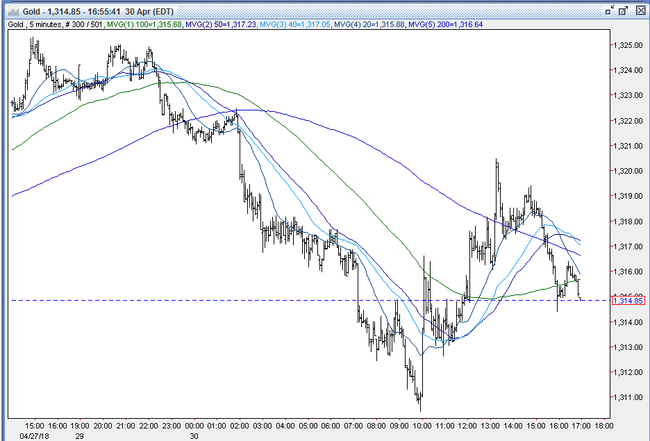 The DX recovered to 91.90, and gold faded back to $1315, where the old double bottom support held. It was $1315 bid at 4PM with a loss of $9. Open interest was off 4.2k contracts, showing a net of short covering from Friday’s advance. Volume was lower but still healthy with 250k contracts trading. The CFTC’s Commitment of Traders Report as of 4/24 showed the large funds cutting 11.5k longs and adding 14.9k shorts to slash the net fund long position to 136k contracts. This was done on gold’s move down from $1356 - $1322. Since the report, around another 10k net longs were reduced, taking the position to around 125k net long – its lowest level since December. While this is certainly not bullish for sentiment, this is a relatively and historically light Net Fund Long Position, and gross shorts at 89k contracts are still somewhat elevated. Combined, it leaves the gold market set up well to move higher as there is plenty of room from sidelined longs to enter, and excess shorts can fuel a rally if / when they are forced to cover. Bulls feeling some pain as the market has fallen $55 in 3 weeks, just when some thought gold was ripe for an upside breakout over $1375. However, some bulls remain undeterred, and feel the market is approaching oversold (14-day RSI = 40). They’re buying toward the bottom end of the range of the past 4 months ($1303 - $1366), looking for at least a pullback to at least $1337 – the 50% retracement level from the 4/11 $1365 high to today’s $1310 low. While some bears have taken profits on their shorts as gold has moved down to the lower end of the recent trading range, others are looking for a bigger score. They’re going to be gunning for a breach of $1307-10 (5 bottoms – 3/16, 3/19, 3/20, 3/21 and 4/30 lows) to trigger some liquidating sell stops to bring into play the 200-day moving average at $1305, and then 3/1 low at $1303. If these levels fail, the bears expect a test of support in the low $1290’s and high $1280’s. All markets will continue to focus on the volatility in the equity and bond markets, geopolitical events, developments with the Trump Administration, corporate earnings, oil prices, and will turn to reports tomorrow on Japanese PMI, UK PMI, US Vehicle Sales, Markit Manufacturing PMI, Construction Spending and ISM Manufacturing for near-term guidance.